Thank you for your article regarding prisons replacing treatment for mental illness in the USA. You wrote, "Though no Dorothea Dix figure has emerged in 2015, at long last policy makers and researchers are waking up to the issue." The idea that prison investors and other decision makers would simply "wake up" to an issue is not true. Through much censorship and intimidation, my advocacy organization continues to fight to highlight the problems of mentally ill people and their families for the past ten years. See "Assistance to the Incarcerated Mentally Ill," a/k/a "The Dorothea Dix Group." We have been operating for ten years online and less in person. In 2003, my brother, Larry Neal, a lifelong mentally ill heart patient, was secretly arrested and murdered on the 18th day of secret incarceration in Memphis Shelby County Jail in Tennessee. The disregard for this black man from his government was so total that to this day - nearly 12 years later, his family is still denied the right to know under what circumstances he died and why he was arrested. In fact, because Larry died in custody in a jail that was already under federal overview after lawsuit by the USA, the USDOJ is actually involved in his murder cover-up rather than attempting to bring justice. See http://WrongfulDeathofLarryNeal.com/main.html and visit our blog "Dog Justice for Mentally Ill" at the first of six (6) AIMI urls below. Through thousands of very graphic articles, emails, and radio broadcasts featuring psychologists, psychiatrists, and families of abused and murdered mentally ill inmates, AIMI continues to make torturous incarceration and wrongful deaths of mentally ill people impossible for any official to ignore. This causes great discomfort for both officials and myself, as my computer equipment is continually compromised or destroyed, my phone calls are often prevented, and messages are stolen from my voice mail service and my email boxes. 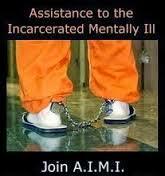 We take these attacks as compliments to the work that we do at Assistance to the Incarcerated Mentally Ill (AIMI). No effective human rights movement has ever experienced decision makers "waking up to the issue" and showing a willingness to change. That did not happen regarding slavery, women's suffrage, the labor movement, nor the civil rights era. Any change you applaud regarding attitudes about mentally ill people having a right of treatment rather than incarceration must be credited to Assistance to the Incarcerated Mentally Ill, Mental Health Policy Organization, Treatment Advocacy Center, and many other fine advocates and prisoner rights activists and tenacious family members who continually strive against forces who profit from the arrests of Americans with mental disabilities. Most do this advocacy work with little or no budgets. AIMI is the only one of those named that deals exclusively with incarcerated mentally ill people and reducing the risks of incarceration through timely treatment - either in mental hospitals or community care, depending on the patient's offenses and ability to survive outside of a controlled environment. That is why our group is also called "The Dorothea Dix Group." AIMI recommends H.R. 2646, "Helping Families in Mental Health Crisis," a mental health care bill introduced in Congress in 2015 by Rep. Tim Murphy (R-PA) and Rep. Eddie Murphy (D-TX), and the bill enjoys bilateral support from numerous congresspersons. More exposure for this important bill is needed. Please mention it in your next article regarding mental health care. We applaud the fact that the U.S. Congress recently appropriated $15million for assisted outpatient treatment (AOT) programs, which were certified by the USDOJ a few years ago but not funded. We believe that America's response to its mental health care crisis should be AOT programs (subsistence assistance and mandated treatment) and crisis intervention team (CIT) training for police and corrections officers, so they will learn how to deal with mentally ill people, of whom 1.25 million are prisoners. Furthermore, HIPPA laws should be relaxed for close family members of mentally ill people confined behind bars or in hospitals so that families and advocates will know their conditions and treatment to better advocate for their appropriate care. Thank you for helping to call attention to the issues faced by the mentally ill behind bars. I hope you will relay information about the tremendous effort of advocates and families of the mentally ill in your future articles so the world will understand that "power concedes nothing without a demand; it never has, and it never will" (Frederick Douglass). In fact, AIMI plans to sue the USA in International Court in 2015 on behalf of up to 100 mentally ill people and families who suffered brutality and wrongful deaths of mental patients. We invite you to call-in and participate on our Wednesday night AIMI broadcasts at Blogtalkradio at 9pmPST. Dial (818)572.2947, if you can schedule the time. We feel that nothing helps officials "wake up" like lawsuits. Dorothea Dix was a plaintiff in numerous lawsuits on behalf of the incarcerated mentally ill during her advocacy. Whereas the indigent mentally ill were regularly warehoused in brutal jail environments before Ms. Dix began her work, fewer than one percent of America's inmates were mentally ill persons by the time she retired. One reason for her success was that there were no private prison owners and investors serving on the state legislatures in the 1800's when Dix petitioned officials to change. We work to make mental health care reform a campaign issue in 2016. Officials should declare their stance on the human rights abuse of imprisoning Americans with mental disabilities. Examination should be made of stock portfolios and political contributions to officials who do not support H.R.2646 "Helping Families in Mental Health Crisis Act" in order to learn which officials are prison investors and receive contributions from private prison companies. We believe that private prison investors should divest or resign. Mary Neal's Google+ - https://plus.google.com/+MaryLovesJustice/posts - Follow me at Twitter @koffietime - http://twitter.com/koffietime - Current, urgent justice issues from a laywoman's viewpoint at my primary blog http://FreeSpeakBlog.blogspot.com Full list of MaryLovesJustice blogs and radio broadcasts: http://marylovesjustice.blogspot.com/2014/03/marylovesjustice-blogs-and-radio-shows.html email address: MaryLovesJustice@gmail.com (I'm censored, but some emails reach my box). Try to phone me at (678)531.0262 or (571)335-1741. If you receive no response within 48 hours, please email or call again. We feel that nothing helps officials "wake up" like lawsuits. Dorothea Dix was a plaintiff in numerous lawsuits on behalf of the incarcerated mentally ill during her advocacy. Whereas the indigent mentally ill were regularly warehoused in brutal jail environments before Ms. Dix began her work, fewer than one percent of America's inmates were mentally ill persons by the time she retired. One reason for her success was that there were no private prison owners and investors serving on the state legislatures in the 1800's when Dix petitioned officials to change. We work to make mental health care reform a campaign issue in 2016. Officials should declare their stance on the human rights abuse of imprisoning Americans with mental disabilities. Examination should be made of stock portfolios and political contributions to officials who do not support H.R.2646 "Helping Families in Mental Health Crisis Act" in order to learn which officials are prison investors and receive contributions from private prison companies. We believe that private prison investors should divest or resign.